come, rock for your rights… – welcome! …at fort cornwallis, penang. don’t instead, go to see our 2malaysia PM who erode your rights! 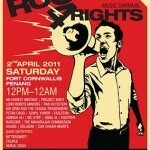 yes, don’t forget, today the rock4rights festival, of which i have blog about it few days ago. you are going to hear songs you rarely heard before… songs of protests and human rights. 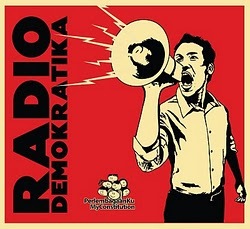 songs from the radio demokratika album. do hop on to their website to find out more. today, while the rock4rights festival is going on in penang, another (supposedly) big event will be going on in penang too – because the PM will be present! it seemed that the PM will be in penang today too for the indian cultural fest at PISA in the afternoon. in the morning, he was at taman sri sardon, gelugor. i didn’t know that until just about an hour ago when i was taking the rapid penang bus no. 302 which passed that way. traffic was heavy and lots of policemen around. then i notice the huge banner, screaming out that the PM (of course with his wife) will be theree at 9.30am. (it was around that time that the bus passed there!). i’ll be at fort cornwallis at 8.00pm for the official opening ceremony. then i’ll help at the saya anak bangsa malaysia stall. oh, there will be a voters registration booth too, so to all of you who have not signed up as voters, please come, enjoy a fun of good music and sign up as voters. the general election is approaching – it’s your rights to vote, so do register, if you haven’t yet. tell your family and friends who have not yet register.